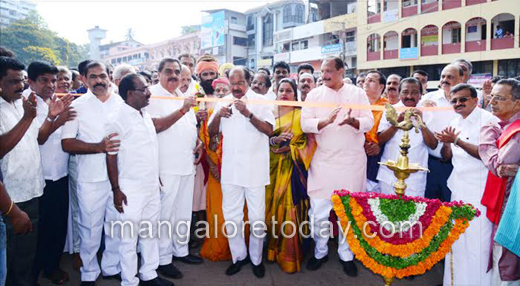 Mangaluru, Jan 14, 2017 : The concretised stretch of Kadri Temple Road, right from the Mahadwara at Mallikatte upto the shrine, was inaugurated on January 14, Saturday by former union minister Veerappa Moily and DK District in-charge Minister B Ramanatha Rai. Nirmalanathaji Swamiji of the Kadali Mutt, inaugurated the formal function held in this regard by lighting the lamp. 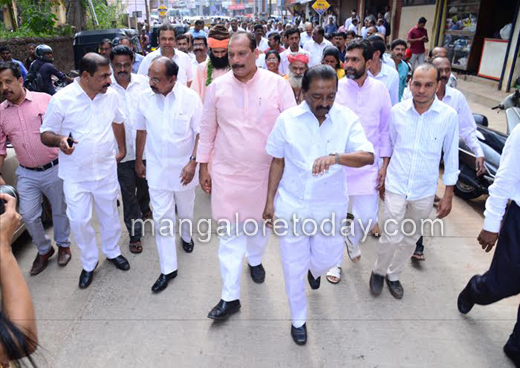 Speaking on the occasion, Moily congratulated the local corporator Ashok D K for the hard efforts put in by him to make this concretised road a reality. The road is the first such road which has been laid with provisions for underground drainage, electricity and telephone cables and water pipelines, he said and stressed the need to adopt a similar model while concretising other roads too. JR Lobo, MLA of Mangaluru South in his address while expressing pleasure over the inaugural of the concretised road, said there were also plans to develop the Kadri crematorium. The project would be taken up at the earliest and the tender process was underway, he informed. Ivan D’Souza, Chief Whip of State Legislative Council, Suresh Ballal, MUDA Chairman, AJ Shetty, Chairman of AJ Institute of Medical Sciences, Ashok DK, local corporator and many others were present. Open for traffic itself i6877 a grand inauguration.